Presented to Nikita Kruschev at the opening of the 21st session of the Communist Party session in 1959, this is an example of the best sporting arms being made in the Soviet Union at the time. 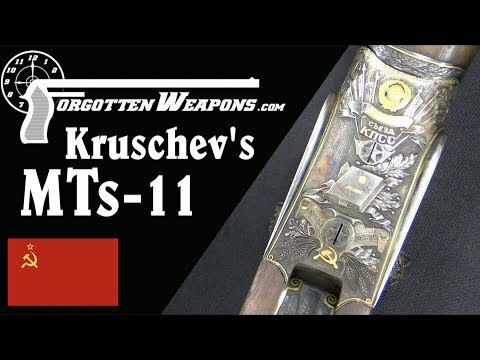 It is an MTs-11 (? ?-11) side by side double gun, mechanically a Beesley-patent Purdey type with plenty of bold engraving. Only some 600 MTs-11 guns were made between 1951 and 1960, by TsKIB SOO (???? ???) – the Central Design and Research Bureau of Sporting and Hunting Arms located in Tula. It is a very well made gun, complete with stereotypically poor quality case, and lacquer coating the barrels for some reason.